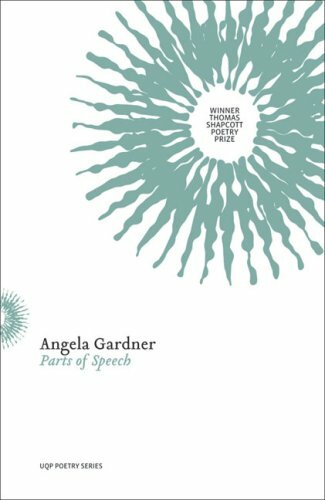 Angela Gardner's Parts of Speech shows what a substantial first book of poetry is all about. Gardner has responded, above all, to an ideal opportunity to show what excites her thoughts and propels her into action as a poet. Her ability to turn that initial energy into a form of words both excites and challenges the reader. In this regard, Gardner seems urged to speak about what small actions may be worth pursuing to maintain or re-create a natural and preferred order of events. Gardner seems drawn to particulars of motion. Her approach makes Parts of Speech into a discovery of the kind where what has been taken for granted is purposefully being re-injected with new patterns or old patterns re-used newly. In a sense, part of the excitement that the work engenders comes from its being a study in discovery that is not properly so (that is, a brand new finding or invention) but a revisiting far enough removed from an earlier connection so that the latest association feels like a new meeting. It therefore tries to do what all poetry attempts, to return to what was just experienced in order to view it again more clearly, with purpose. If there is a form she prefers, I would say Gardner seems to be using something of Arnold Schoenberg's 12-row system or serial repetition of a musical 12-semi-tone chromatic scale, each group of sounds forming a row' that may be played forwards and backwards. Each row in such a system was meant to hold up a thematic structure, much as Jack Hibberd used it in The Genius of Human Imperfection to focus point and counterpoint in human relations. Gardner first introduces this approach through poems made of couplets, Notes for a day at the National Gallery', Twelve postcards', Twelve labours' to a steady purpose (her use of numbers and seriality, not gone unnoticed) anchoring motifs of axes of motion, telescopes, mirrors, horizontal and vertical rotation. Her dichotomous themes support this: Cartesian duality, rural and industrial, industrial and post-industrial, aloneness and oneness with the idea of universal schemes. Atonality serves her well in her emphasis on the point where the serial ends and rotates or begins again, so that her approach is more subtle and less easy to move through than that of Hibberd's rhymes, for example. Sometimes, however, I wondered at Gardner's syntax and apparent (or what may well be in some instances) misspellings and typographical errors in a few poems (see Redemptor' and Three positions acting on space'). There is no doubt though, that the strength of her approach is appreciated when it is clear that the poems become very real events to us, as readers, when the occurrences within them and the matters they describe give value to the poems through a kind of serialisation via readers' memories of those or similar events. While, on the one hand Gardner may not be using the atonal system expertly, on the other she certainly is doing so playfully, in the sense, at least, that other poets, such as, MTC Cronin, also seem to be doing so. All in all, her purpose appears to be that there is no structure save our ability to individually create one as we read words, the sky, our memories. And so, the poem or language instruction becomes a transaction of a kind of serial framework, in this case. Gardner's work is not only about the structure of speech-sound but about the structure of sound-space, drawing a similarity between her work and Peter Boyle's in Museum of Space. This entry was posted in BOOK REVIEWS and tagged Angela Gardner, Bev Braune. Bookmark the permalink.